Primary Numbers is a great way to count up all the things that make New Hampshire special. 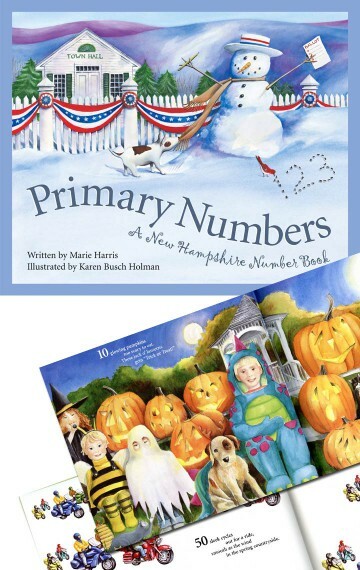 Primary Numbers: A New Hampshire Numbers Book is a fitting follow-up to its companion state alphabet book. This fun, colorful, and superbly informative book teaches children about numbers using recognizable places, events, and facts from their respective states. Numbers throughout the books are explained with simple rhyme for younger children and are accompanied by detailed expository text for older learners. Marie Harris (New Hampshire’s Poet Laureate 1999-2004) is the author of G is for Granite: A New Hampshire Alphabet as well as four books of poetry, including Weasel in the Turkey Pen and Your Sun, Manny: A Prose Poem Memoir. Marie lives in Barrington, New Hampshire. Karen Busch Holman shares her love of art by teaching children private art lessons and visiting elementary schools in New Hampshire. Karen makes her home in Barrington, New Hampshire.